The following post is part of a series I wrote for the American Historical Association’s Graduate Student Blog Prize on 3 August 2017. The original posting on their website can be found here. Driving down south from Keetmanshoop toward Grünau on southern Namibia’s B1 trunk road, it’s common to spot small mammals hustling across the highway from one stony outcropping to another as the road weaves through the Karasberge (Karas Mountains). These are rock hyraxes (Procavia capensis)—known in Southern Africa as dassies—and despite being completely herbivorous, they were classified as vermin in Namibia under apartheid. As I was reading through the files of the South West Africa Division of Nature Conservation & Tourism (Afdeling Natuurbewaring en Toerisme; NTB) to get a better understanding of research conducted on carnivores, I came across a number of files with labels that translated to “Problem Animal Research: Dassie Ecology and Control.” The files seemed a bit out of place among folders on jackals and caracals. This final post in my 3-part blog series continues my narrative into the 1980s and explores some of the unintended consequences of predator extermination in Namibia, noting changes in how farmers and conservationists understood local ecological systems. I conclude the series with some brief thoughts on how historians can approach transformations in human-animal and human-environment relations. In October 1966, farmers in Aroab, a small agricultural town in southeastern Namibia, faced a difficult situation: rodents and other small mammals had descended upon the district, eating the grasses and reducing the pasture condition to such a state that the district’s sheep were left with little to eat. 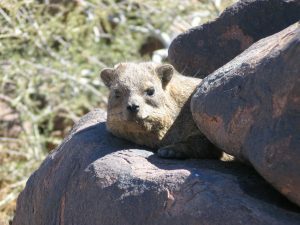 Similar infestations were occurring throughout southern Namibia around this time; the main culprits were deemed to be dassies, Cape and scrub hares, and the Cape gerbil (known as nagmuise). The infestations sparked outcry from local conservationists, who argued that the rise in the number of ground mammals was linked to the wanton destruction of predators: over the previous 18 months, at least 22,242 jackals had been exterminated. Conservationists did not appeal for an end to jackal killings, however. Instead, they asked for it to be done in a much more controlled manner, taking into consideration the ecological role of jackals and other animals classified as “vermin.” They noted that while it was necessary for farmers to eliminate certain carnivore offenders, large-scale eradication was unwise without increased understanding of the diets and ecologies of eliminated animals. 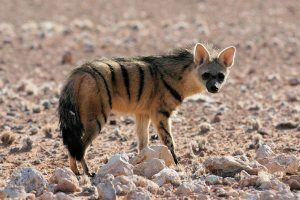 For example, they noted that farmers had only recently realized that the aardwolf (maanhaarjakkals; Proteles cristata), which looked suspiciously like a jackal from a distance, was actually related to the hyena. Importantly, the aardwolf was 100 percent insectivorous, fed mostly on termites, and served a constructive role for farmers by eating insects that degraded fencing posts. Eliminating aardwolves because of surface-level similarities with predators could cause farmers more trouble than the cash bounty was worth, the conservationists argued. Additional research and political pressures led the NTB to change vermin categories to reflect the purpose of control: profit. The NTB also came up with a more inclusive, yet ambiguous term “problem animal,” to define any species that caused “appreciable loss to the local agricultural economy” and whose numbers should be reduced. In other words, problem animals were creatures that got in the way of agricultural production, and the NTB reoriented its research to look at methods of controlling them. In the mid-1970s, Johan Lensing was brought on as the director of nature conservation at NTB and he made the “dassie plague” a major priority—farmers in the Karasberge complained that dassies were coming out from the rocks to graze on the veld, removing sparse quantities of pasture that karakul sheep needed. Lensing quickly identified reasons for the growing dassie population, noting that for the past 10–15 years, farmers facing dassie problems had erected jackal-proof fencing and engaged in predator extermination campaigns. Lensing sought to temporarily control the dassie population using poisons such as telodrin, thallium, 1080 sodium fluoroacetate, and some antifertility agents, but in the end, he and other NTB ecologists advocated for restoring predator-prey relationships. 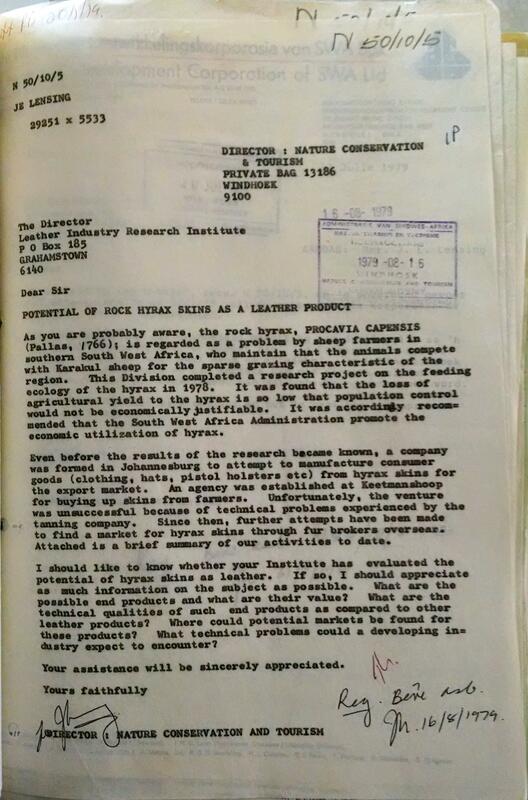 These requests, however, fell on deaf ears as farmers, interested only in short-term goals, continued to eradicate jackals. The dassie situation, however, was more complex and harder to manage, yet less serious than originally thought. On several farms in Karasburg and Keetmanshoop districts, Lensing examined stomach contents and found that, while it was true that dassies competed with sheep for grazing in dry seasons, they also utilized browse—high-growing vegetation—compared to the grasses preferred by the karakuls. 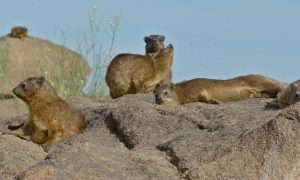 Furthermore, dassies stayed near the outcroppings that provided them protection from birds of prey and jackals; therefore, the only grazing competition was near the rocks (poor grazing anyway). Finally, Lensing ran calculations on the economic cost of the dassie plague on affected farms and concluded that no more than 1 or 2 percent of profits were lost. This is crucial because while farmers complained about all “problem animals,” they recognized that the jackal was the most serious. If a 3.5 percent predation rate could be negated with the caveat of a 1 percent loss through grazing competition with dassies, most farmers would take dassies over jackals any day. Furthermore, the actual process of eradicating dassies would have been maddening and incredibly labor intensive because the animals lived in outcroppings and not in burrows, making fumigation impossible. The only way to deal with dassies was to kill them manually with rifles and hounds, or to lay poisoned grain, which could harm livestock as well. Lensing’s team conducted research into the economic potential of hunting dassies for pelt production, but this ended after failed preliminary tests. As few white farmers wished to re-engage the workers they had only just released, controlling these new “problem animals” would only be desirable if labor costs were low enough. At the end of the day, the karakul sheep was king, and dassies were thought to be an acceptable replacement for carnivores despite their long-term negative ecological effects. Among vermin, jackals were still the top dog. 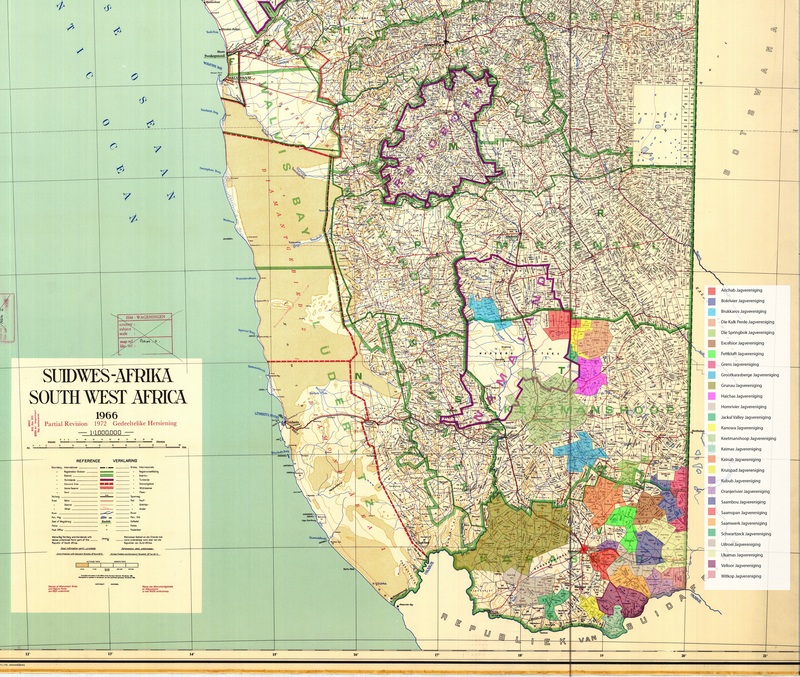 Over the course of the 20th century, southern Namibia transformed completely. White farmers who’d entered the region several decades before with only a few dozen merino sheep became highly specialized fur producers, exporting over 3.4 million karakul pelts annually at their 1971 peak. 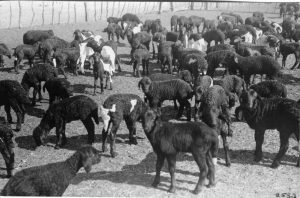 Advances in breeding increased the fertility of their ewes and stud rams standardized and improved the quality of pelts. 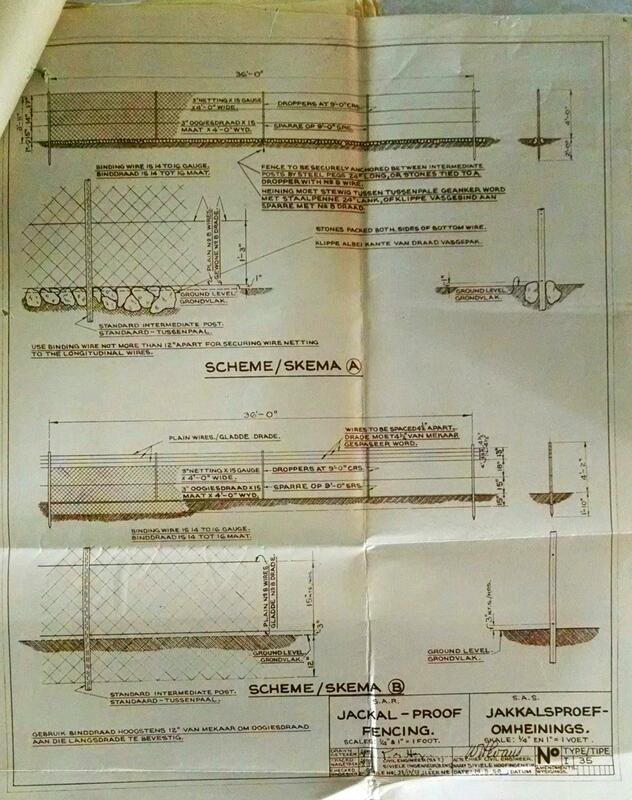 Bottlenecks were overcome, as fixed-capital investment into jackal-proof fencing and coyote getters reduced predation and slashed labor costs. Increased profits enabled faster turnover with many farmers participating in air freight service that brought pelts directly from the south to London’s auction houses. But as Frederick Engels noted in 1872, capitalism rarely solves its constraints and bottlenecks, it merely shifts them elsewhere. This is why looking at rock hyraxes and similar small mammals is so important to understanding the economic and environmental history of Namibian agriculture. While technological innovation increased the profitability of sheep farms in the region, some of the increases in revenue were lost to dassies and overgrazing, leading to doubts about the long-term viability of intensive karakul sheep farming in arid southern Namibia. While jackals may eat a lamb, dassies and poor range management may starve it. These fears came true with the near-collapse of the karakul industry in 1980–82, when the subcontinent was hit by one the strongest droughts of the century. With Namibian independence in 1990, it seemed that life would improve for the black population, but gains for farm workers have yet to be realized. Today, a number of white former sheep farmers in South Africa and Namibia have transformed their properties into game farms, seeking to tap into the biltong (game-meat jerky) and tourism markets, which have grown significantly in the post-apartheid years. Furthermore, labor reductions have continued; Brandt & Spierenburg have noted that game farms require far less labor than sheep farms. In many locales in southern Namibia, rural poverty and unemployment has increased since independence, and the purchasing power of the rand/Namibian dollar has decreased significantly. As James C. McCann reminded us back in 1991, far too many studies of agriculture on the African continent engage with it only as a subfield of political economy, with little interest in agricultural technology, field systems, or range ecology. Historians of agriculture and rural capitalism must try to reveal the relationships between labor, markets, ecology, livestock, and wild animals. I hope that my (ongoing) work in southern Namibia is a small step in this direction. The following post is part of a series I wrote for the American Historical Association’s Graduate Student Blog Prize on 20 July 2017. The original posting on their website can be found here. If the 1920s in southern Namibia featured violent colonial interventions to facilitate the transfer of black pastoralists’ land and labor to white ranchers, the 1930s–60s were a time of consolidation of white capitalist agriculture—to make it stable, profitable, and “modern.” In Namibia, and southern Africa broadly, “modern” agriculture was often conceived of as technologically innovative, leading to increased outputs. This intensification and application of new technology can be observed in vermin control. 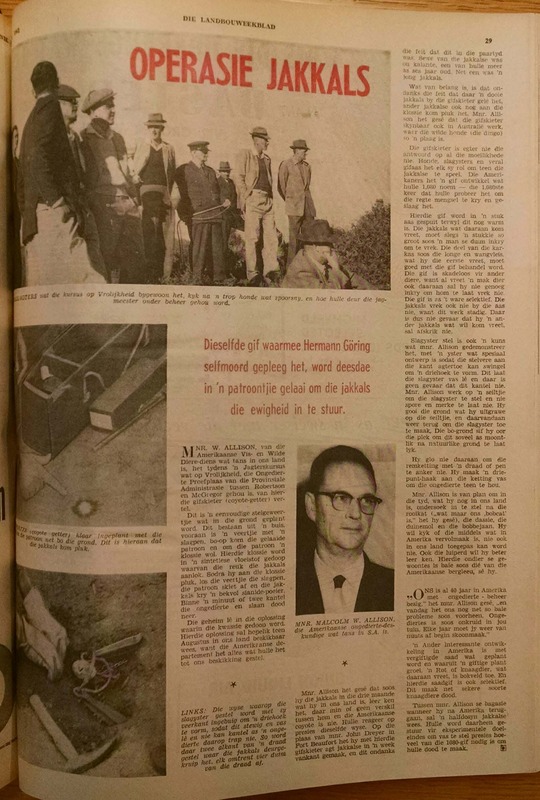 While visiting the National Archives of Namibia about a year ago, I discovered a short 1961 article in Die Landbouweekblad—one of the main agricultural publications in southern Africa—describing the visit of Malcolm Allison (an expert on American coyotes) to South Africa. 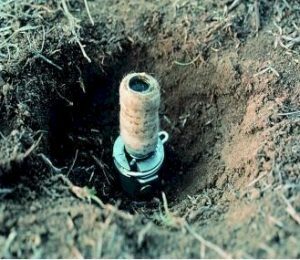 Prominent sheep farmers were invited to test out new control methods and poisons from America, which purportedly would help destroy jackals in the region. The report fascinated me—Allison’s visit represented an understudied aspect of knowledge and technology transfer, and revealed some of the fervor surrounding “modern” farming. In a recent article, Steven Stoll calls on environmental historians to closely observe not only the form of technology, but its place in broader social relations. The difference between a scythe and a harvester, for example, is less that the harvester cuts wheat at a faster rate, but rather that each represents “different assumptions about the purpose of production.” This post explores how between the 1930s–60s, defensive vermin control practices were “modernized” into offensive vermin extermination strategies. This technological shift was driven by colonial/apartheid desires for a stable white agricultural sector less dependent on local black labor. 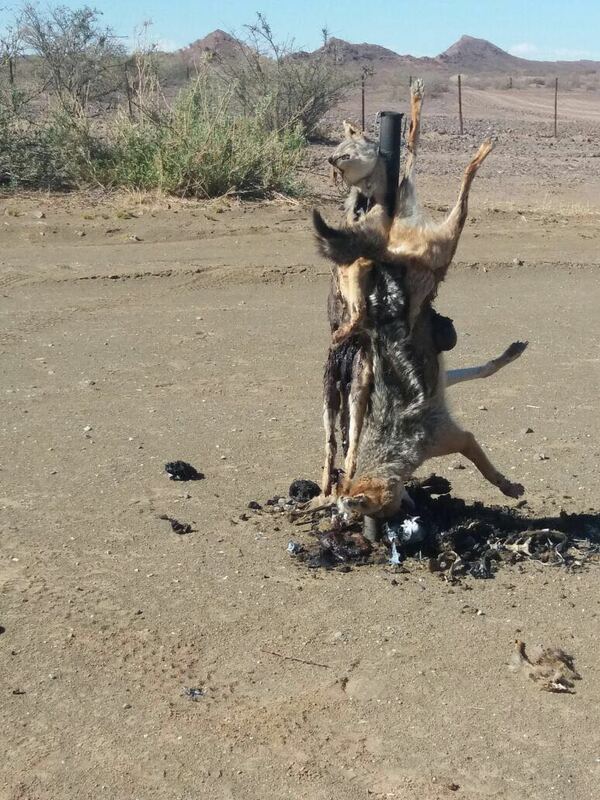 In the years after its killing of unlicensed dogs, the colonial administration in Namibia recognized that the number of jackals had increased. As a result, it passed legislation in 1927 creating a network of local “vermin clubs,” made up of 12 or more white farmers who met several times a year to kill vermin: jackals, rooikat, baboons, leopards, etc. Importantly, only white settlers could be members, and all members were granted up to two dogs tax free. The colonial administration also began to pay out valuable bounties for vermin skins. But while in previous years some Namibians, both white and black, had been able to occasionally make a living through vermin destruction, the new legislation formalized and racialized the bounty system in such a way that only white farmers could take advantage of it. While the vermin clubs did not provide the onslaught against jackals that the state had envisioned, they were the first step toward intensifying predator control: moving vermin destruction away from defensive control measures practiced by individual farmers toward offensive extermination strategies formalized by regional and central institutions. During the 1930s–40s, the Department of Agriculture also started selling strychnine poison at discounted rates to white farmers. Furthermore, the expansion of karakul sheep farming and lambskin pelt production incentivized farming associations to petition for more systematic control measures. As a result, from 1955–56, the administration investigated new fencing strategies to reduce predation. Inspired by developments occurring in some of the South African Karoo districts, which had through fencing, hunting, and poisoning nearly eliminated the jackal threat, the Department of Agriculture concluded that jackal-proof fencing was key to addressing predation rates (the percentage of a farmer’s livestock lost to carnivores each year) in Namibia, which could be reduced from 1.5–3.5 percent to nearly zero. Crucially, the investigation concluded that nearly half of the shepherding workforce—who were mostly black teenagers or young adults unable to find higher-paying work in the mines—could be made redundant and released. Fredrik Lilja revealed similar trends in his study of jackal-proofing in South Africa: several well-paid shepherds could be replaced with a single low-paid “camp walker,” who tended to fences, rather than sheep. It was decided that if white farmers elected to register their resident district as a Soil Conservation District (grondbewaringdistrik; hereafter GBD), jackal-proof boundary fencing (tussenheining) between the farms would become mandatory and partially subsidized in cost by the administration. Jackal-proof fencing, as Janie Swanepoel has described regarding more recent periods, was a new kind of spatial predator control. It involved more material than ordinary fencing, making it unaffordable to many farmers prior to apartheid-era subsidies. Large quantities of wire netting were affixed onto existing galvanized-wire fencing, which prevented the jackals from slipping between the horizontal strands. Furthermore, the structure was buried up to six inches below the ground to prevent animals from digging underneath, and it was sometimes built with a veranda to keep the canids from climbing over. In conjunction with these fencing ordinances and increased enclosure of farms in the GBDs of the south (Karasburg and Keetmanshoop districts), a new policy of offensive vermin eradication was brought in. From 1956, the hunt clubs of the 1920s were reincarnated in new and improved forms. Farm owners were required to construct access gates in their perimeter fencing to allow for vermin clubs to enter their land to hunt jackals. 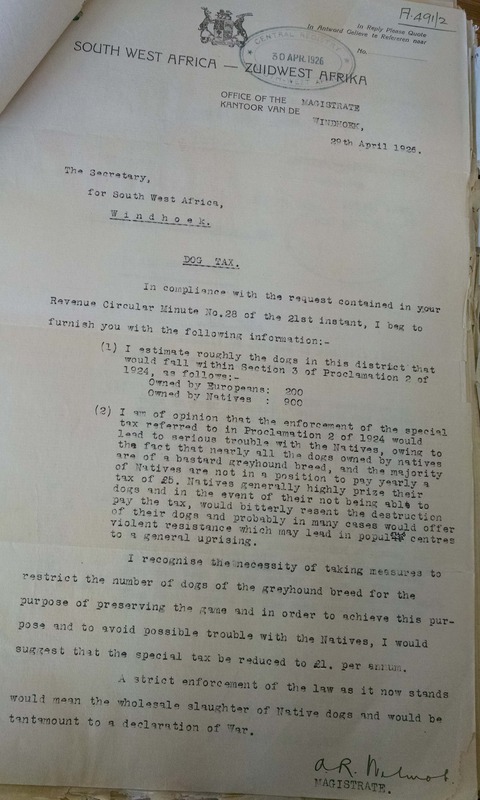 Clubs were permitted to hunt on farms adjacent to the club’s defined territory (gebied), and any jackals killed in this process resulted in a fine levied by the club onto the farm owner; these heavy fines also applied to African communal lands, such as the Bondelswarts Reserve. Over the first few years after the promulgation of the 1956 Vermin Extermination Ordinance, over two-dozen jackal clubs were quickly formed within the GBDs. Within a few years, most of the south was covered by hunt clubs. By 1964, extermination reached a new level. After the annual congress of the National Wool Growers’ Association (Nasionale Wolkwekersvereniging; NWKV), the Department of Agriculture endorsed its proposal to form District Hunting Associations (Distriksjagverenigings; DJV). All landowners residing in GBDs were now required to be members of the regional DJV and pay an annual membership fee. These funds enabled purchase of vehicles, poisons, weapons, traps, and dogs. Furthermore, the funds were used to hire full-time vermin hunters to lead collaborative commando hunts, or lay traps and poisons on their own. Of critical importance to the success of DJVs in eliminating jackals was the adoption of the US-manufactured “Coyote Getter” (gifskieter). Getters are five- to seven-inch stakes hammered into the ground featuring a powerful spring- or gunpowder-based ejector that fires a cyanide bullet into the mouth of the canid taking the bait. Death is relatively quick, though painful. In 1961, Malcolm Allison and representatives of the US Fish and Wildlife Service offered gifskieter training at South Africa’s Vrolijkheid vermin experimental farm (ongedierte proefplaas). The trials at Vrolijkheid were a success, and farmers found that in combination with other strategies, getters had high kill rates for jackals across all terrains. Gellap-Ost, southern Namibia’s government farm, imported several hundred gifskieters in the 1960s from Colorado, and after successful trials, the administration promptly ordered more gifskieters to be distributed among DJV members who had received training based on the Vrolijkheid courses. With farms enclosed with jackal-proof fencing and hunting associations armed with the latest poison technology, jackals seemed not to stand a chance. The number of jackals and other carnivores killed in these years was reported to be immense. As noted previously, this was not merely a quantitative change in jackal eradication, but a qualitative one. 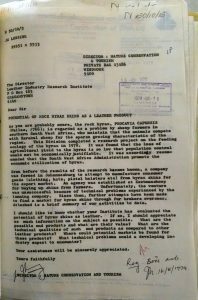 When offered heavily subsidized training and breeding facilities for jakkalshonde (jackal-hunting dogs) by the NWKV and the South African Vleisraad (meat board), the Department of Agriculture flatly turned them down on grounds that gifskieters and other poisons (like strychnine and Compound-1080) were more effective. This was a qualitative shift; jakkalshonde would have been intended for defensive, targeted killings of problem jackals, rather than toward complete eradication. Gifskieters and gin traps (slagysters), on the other hand, were non-targeted methods of control; they killed young, old, male, female—it did not matter. Of crucial importance is that eradication strategies were a form of fixed-capital investment intended not only to reduce predation, but also to reduce labor costs. There is evidence of decreasing employment of shepherds on highly capitalized southern farms. A 1958 survey among farmers in Gibeon and Warmbad districts revealed that the mean number of farm workers had decreased to fewer than three. Many of these were contract workers from northern Namibia by this point as well, rather than local Nama labor. The following post is part of a series I wrote for the American Historical Association’s Graduate Student Blog Prize on 16 June 2017. The original posting on their website can be found here. In May 1922, the Bondelswarts (a Nama nation in southern Namibia) took up arms against the South African colonial administration. The short-lived and poorly organized uprising was put down with ground troops, machine guns, and airplane bombing of the reserve. Prior to the uprising, the Nama constantly complained over a tax on dog ownership that was introduced into the rural areas in 1917. In precolonial times, sheep pastoralism was key to the economies of the indigenous Nama in southern Namibia. Nations such as the Bondelswarts engaged in circular migration between Namibia and the Northern Cape, following sparse rainfall, grazing, and ephemeral rivers. Beyond the oft-feared frontier stock raiders and armed colonial commando troops, sheep farmers faced enemies, particularly the jackal (Canis Mesomelas). The onset of settler colonialism in southern Africa had led to the decimation of apex predators such as lions and hyena because of the threat they posed to cattle production. This allowed jackals, who have shorter gestation periods and variable diets, to rise up the food chain—a process known as “meso-predator release.” Importantly, the rise in jackal population became concentrated in sheep-farming regions. As sheep numbers grew, jackals adapted their diets and pursued slow-moving livestock instead of ever-dwindling game and less satisfying rodents. In protecting their livestock, the Nama had to innovate. Firearms (mostly matchlock muskets) were expensive and unreliable; instead, many Nama engaged in rigorous dog breeding and training as a defensive form of vermin control. In these districts, the Nama found sighthounds (lurchers) to be far more useful than scent-hounds: the flat, dry expanses make it easy to spot vermin from a distance, but the low humidity and high evaporation make it difficult for dogs to follow a scent for too long. Dogs were trained using scents, but the scent was generally of the shepherd or his flock. Dogs were given sheep’s milk to drink, or fed some dried meat that the shepherd had been carrying in his veldskoene (rawhide shoes) for some time. The Nama even built trust by applying armpit sweat directly to the dog’s nostrils. Loyalty was key, as the fate of the flock was at stake. In conversation with several Bondelswarts families, I learned that shepherds kept at least two dogs each, one male and one female, as many Nama feared that if a female jackal was in heat and approached the sheep, a male dog would not kill it or chase it away. The process of killing predators such as jackals was observed by many travelers to precolonial Namibia, including Gustav de Vylder, a Swedish naturalist who participated in several hunts with the Nama. He observed that when predators approached the kraal (protective corral of bush wattle), a line of dogs would be strung out across the veld. The Nama would then walk toward the predator until the dogs had encircled the creature and eliminated it. 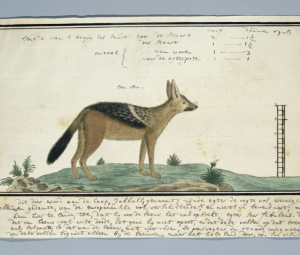 Beyond killing jackals for pastoral production purposes, their pelts could be sold to the Cape trade, and jackal meat was considered a delicacy. This was a defensive arrangement, however. While the Nama did occasionally go jackal hunting with their dogs, they were far more likely to keep the dogs with the flock for local protection. Dog ownership became even more important as colonial settlement increased in the late 19th and early 20th centuries. After the 1904–07 genocide by the Germans, migratory pastoralism became increasingly difficult as large portions of Nama land were seized by former soldiers turned settlers. Furthermore, colonial laws forbade all but the kaptein (Nama headman) from owning firearms. Dogs became a precious resource for embattled pastoralists seeking to avoid poorly paid wage work on settler farms. Against these odds, many Nama successfully maintained subsistence pastoralist production, exacerbating labor shortages on heavily subsidized white farms. Enter the dog tax. Every year from 1917, both white and black Namibians were required to purchase a licence for each dog they owned. Those caught refusing or unable to pay the tax were fined, and their dogs killed if the balance was not settled within the week. It was routine for more dogs to be killed than those registered and licensed. In 1917 alone, at least 2,830 African-owned dogs were killed. The racialized enforcement was clear; the European-owned number was only 135. For many Bondelswarts, the tax was impossible to pay. Average wages in 1921—when the tax was £1 per dog per annum—were between 15 shillings and £1 and 10 shillings per month. Those not formally employed had to sell livestock or labor for cash, and many felt that the systematic collection in the Bondelswarts reserve revealed that the tax was being used to address labor shortages. Gijs Hofmeyr, the administrator for the Namibian mandate, admitted as such. In 1923, he stated that the dog tax was necessary to incentivize the Bondelswarts to take up “honest labour,” which he conceived only as wage labor on white-owned farms. Hofmeyr and the colonial administration were ignorant of the nature of the Nama pastoral economy, believing that dogs were solely used for hunting game, and therefore providing subsistence for the people. Most scholarship on the Bondelswarts uprising has followed this analysis, looking at the dog tax as a closure of hunting commons. My research, however, reveals that the tax didn’t affect game hunting much—it was already marginal at that time—rather, it weakened the Nama’s pastoral production system by making it costly to own hounds. In a sense, the dog tax provided a subsidy for poor white farmers struggling to compete with black pastoralists or obtain laborers. It’s difficult to ascertain exactly how many Nama entered wage labor directly because of the dog tax alone. The tax, however, provides an interesting insight into proletarianization during this era. Dogs were seen by the Nama as a form of agricultural technology, or, in Marxist terms, dogs were part of the productive forces. Targeting dogs, then, challenged sheep pastoralism. In my next post, I will explore the ways in which vermin extermination intensified in subsequent decades.Reconstructing the economic role of man’s best friend in Namibia is not always an easy process, and it necessitates critical engagement with precolonial traveler’s accounts, publications and papers of volkekundiges (colonial/apartheid ethnologists), veterinary and agricultural reports and research, not to mention mountains of administrative correspondence with magistrates and local farmers. As Susan Nance has written, “Animals are everywhere, and there has never been a purely human moment in world history.” Whether they were dogs, vermin, or sheep, these animals were present throughout history, but we only tend to find them lurking at the margins of this documentation. Even if we are writing about decidedly anthropocentric topics like agricultural production and conflicts over farm labor and proletarianization, we must try to locate the nonhuman in “animal-sensitive histories” to reveal points of friction that would otherwise go unnoticed. In this sense, a dog tax could affect sheep, jackals, and shepherds just as much as canines. After World War I and the stripping of Germany’s colonies, Namibia became a Class-C League of Nations mandate under administration of its neighbor, South Africa. Settler colonial policies were quickly put in place. Similar observations have been made regarding coyotes in the American West. This licence had no veterinary aspects or requirements; it merely meant that the dog was owned and alive, and that payment was made. Twenty shillings to the South African pound. Of these wages, a large percentage was paid in kind as well, such as work-for-grazing arrangements, reducing the possibility to accrue savings for taxation purposes. 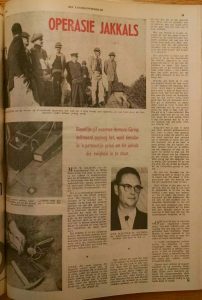 The following post is part of a series I wrote for the American Historical Association’s Graduate Student Blog Prize on 9 June 2017. The original posting on their website can be found here. Over the course of my research into sheep farming in Namibia during the colonial and apartheid periods (emphasis on 1915–82), I’ve grown to realize that I’m writing less and less about sheep and more about all sorts of other animals, from jackals to hares and rock hyrax. Sheep farming involved a lot of killing, not just of ewes for mutton or newborn karakul lambs for pelts, but also of mammals that interfered with production. Throughout the 20th century, these other animals—carnivores and herbivores alike—were classified as “vermin,” or ongedierte in Afrikaans, which translates literally to a “non-animal” or a “de-animaled” entity. Vermin was a liminal classification—neither human nor livestock nor game—and therefore not subjected to legislation pertaining to either property or killing. When it comes to animal killing in Africa, we generally associate it with either poaching or legal big-game trophy hunting, whether for lions, eland, or even the occasional rhinoceros. Films, photographs, travelogues, and even academic texts like John MacKenzie’s Empire of Nature (1988) and Edward Steinhart’s Black Poachers, White Hunters (2006) have followed this trend. The majority of animal killing, however, is actually quite mundane and an integral part of agricultural production, rather than resource extraction.I argue that it’s possible to learn quite a lot about sheep farming by examining all the other animals that were killed in the process; my dissertation explores transformations in vermin control as a lens into capitalist intensification of sheep farming in southern Namibia. The ways in which farmers, both black and white, dealt with “problem animals” (a parallel term for vermin) provide insights into labor relations, conceptions about environmental change, and the nature of rural power under colonialism and apartheid in Namibia. Just as the sly jackal creeps throughout the Namibian pastures, issues regarding vermin find their way into much of the archival records pertaining to agriculture and agricultural production. Whether it was the indispensability of shepherds and hounds on unfenced farms, fears of added grazing loss during droughts, termite rot of fencing posts, or transferral rabies to livestock, vermin control was on the lips of farmers, workers, agricultural officers, and conservationists. I hope that these pieces will be of interest to those in the fields of African, environmental, and animal history, as well as historians of capitalism. Each of these vignettes will provide alternative ways of looking at Namibian agriculture under colonialism and apartheid, and will show that sheep farming involved a lot more than just sheep.I invite AHA Today readers to follow me as I explore three vignettes into the history of animals in arid southern Namibia, based on materials collected at the National Archives of Namibia. The first post will look into the history of dogs, particularly sight-hounds, in Namibia and their relationship to vermin control; the colonial state’s taxation and eventual destruction of African-owned dogs was partially a response to shortages in agricultural labor on white-owned farms in the early 20th century. 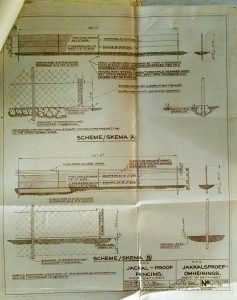 The second post will explore the history of two technologies—the coyote getter (gifskieter) and jackal-proof fencing—in Namibia, noting how each related to subsidies given to white farmers under apartheid in the 1950s–60s. The final post will illustrate how increased understanding of predator-prey relationships in the 1960s–70s led to tension within the apartheid administration over whether jackal extermination should continue. Bernard C. Moore is a doctoral student in African history at SOAS, University of London. He holds an MA in African American and African studies from Michigan State University. His dissertation draws from economic history, environmental history, and animal history to explore transformations in sheep farming, agricultural labor, and vermin control in southern Namibia under apartheid. He can be reached at bernardcmoore@gmail.com. I was sifting through files in the National Archives of Namibia last year working on my M.A. Thesis on economic and labour history in Southern Namibia. Throughout these long days, one inevitably finds archival files and boxes which, unopened, seem useless for the specific project one is working on. But when explored further, really interesting insights come forth. This is one of those cases. I was trying to understand the relationship between taxes and labour recruitment during the early years of South African colonialism in Namibia. In these years, seemingly strange taxes and fees were implemented and enforced: the Wheel Tax, the Dog Tax, Dipping Fees, etc. When one compares the revenue gained to the large financial costs of enforcement, it becomes evident that there were other motives to these taxes than just supplementing the state budget. Enforcing the dog tax in rural areas required huge amounts of ammunition, petrol, horses, metal for badges, not to mention the salaries of overworked police and bureaucrats. It is difficult to do a formal cost analysis because of the often incomplete data, but it’s clear that many taxes were a net loss for the colonial state. Why implement and enforce them then? In order to explain further, let’s get some context. Dr. Wolfgang Werner, Associate Professor at N.U.S.T., wrote in his 1998 book ‘No One Will Become Rich’: Economy and Society in the Herero Reserves in Namibia, that the early years of South African colonialism were a time of ‘self-peasantisation’. This means that black Namibians were deliberately trying to remove themselves from wage labour to pursue an independent existence. Mobility and land access was facilitated by the internment of many German farmers and the removal of German police; it took time for the South Africans to move in. One of these strategies Dr. Werner briefly explored in his dissertation was stock theft. This intrigued me, so I looked deeper. I found an interesting file in the National Archives describing a controversial case of stock theft near Keetmanshoop. 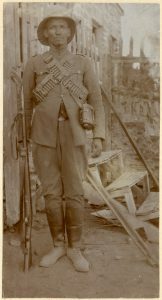 Mr. R.J. Van Wyk migrated to German SWA from the Orange Free State around 1907 with Sara Bloom, a South African woman, and her two children from a previous marriage: Christian and Susanna. They arrived in Keetmanshoop district and began raising sheep. In September, 1915, Van Wyk wrote to the Administration in Windhoek reporting stock theft and his subsequent inability to find any black Namibians who would work for him. When the war broke out, Van Wyk left Keetmanshoop district for Prieska in South Africa for ‘business reasons’. He left behind 3000-4000 sheep under the supervision of his stepson Christian. When he returned a year later, he found only 963 sheep remaining. Out of confusion, he searched nearby farms and black locations, noting a significant increase in the numbers of black-owned sheep. In addition, all of the sheep he found in the locations had the ears ‘mangled’ – cut off low at the base of the ear, removing any ID tags Van Wyk would have used. He had no other identification for these sheep, so the administration responded to his letter saying that he cannot prove they were stolen. When the Magistrate interviewed Christian about the matter, he found it was far more complex than a case of spur-of-the-moment stock theft. Christian, Susanna, the workers and servants were regularly beaten by Van Wyk with sjamboks. Christian claims that he was once hit by Van Wyk with a brick and knocked unconscious. Also, Van Wyk was never actually married to Christian’s mother. After her death in 1911, Van Wyk began forcing himself upon Susanna, Christian’s sister, aged sixteen, and he fathered a child with her. The actual reason for Van Wyk leaving to Prieska was to avoid being prosecuted for indecency: fathering a child with Susanna and falsely stating that she was his wife. He fled just before the arrest was to be made. These testimonies can teach us a lot about stock theft during this period. Christian admits that a few hundred stock were sold to pay for workers’ wages, food, and clothing after Van Wyk fled to Prieska. He also notes that there was near universal hatred for Van Wyk. It becomes clear that the sheep were taken in a planned manner with forethought, perhaps with the assistance of Van Wyk’s ‘stepson’ Christian Bloom. Regardless of the new owner of the sheep, all had cut the ears to reduce identification purposes. So what does this have to do with taxes? In these early years of South African rule, taxes became an important way to coerce black Namibians to work on white-owned farms; many taxes were not about state revenue. As Dr. Werner pointed out, many black Namibians were distancing themselves from wage labour. 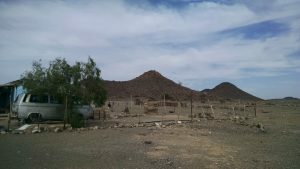 Stock theft was a way to gain self-sufficiency; stealing enough sheep so you could qualify for a ‘labour exemption certificate’ was a crucial way to avoid becoming dependent on abusive white employers like Van Wyk (exemption was granted to Namibians with more than ten cattle or fifty small-stock). Taxes served as a way to make independent existence more difficult and cut into the gains black Namibians made after the Germans were defeated. To conclude, was all stock theft like this? No. Many stock were stolen on a one-off basis; someone wanted a sheep, so he took it. What the R.J. Van Wyk case shows us, though, is that stealing sheep during this time was more than just a ‘criminal’ activity; it was a political statement: a desire for economic and social autonomy from the white colonial state. And it had the support of many people; one person could not have stolen over 3000 sheep from Van Wyk. -N.B. : Names have been changed to protect anonymity. For those interested in learning more, consult National Archives of Namibia, ADM box 2, file A.13/15. 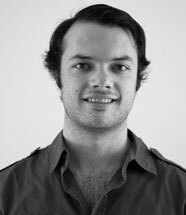 -Biographical Note: Bernard C. Moore is a doctoral student at the University of London, School of Oriental & African Studies. He recently completed his M.A. at Michigan State University, USA, with a thesis titled ‘Canines, Carnivores, Capitalism, Colonialism: Some Transformations in Hunting, Agriculture, and Labour in Southern Namibia, 1915-1930s’. He can be reached at 081 613 3538 or bernardcmoore@gmail.com. It’s sometimes difficult to explain to people why I’m studying the history of the dog tax in Namibia. Many researchers from the USA tend to romanticise certain aspects of history – big ideas, big events. When I say I’m working on the dog tax, people American and Namibian alike tend to sometimes look at me like I’m wasting my time; they often respond with questions like: “Is this needed”? History, though, isn’t just the story of big men and big events, it’s the story of how those big events effected the lives of ordinary people. In the Namibian case, looking at the dog tax is a way to understand colonialism and how it created a system to coerce Namibians into the labour force. 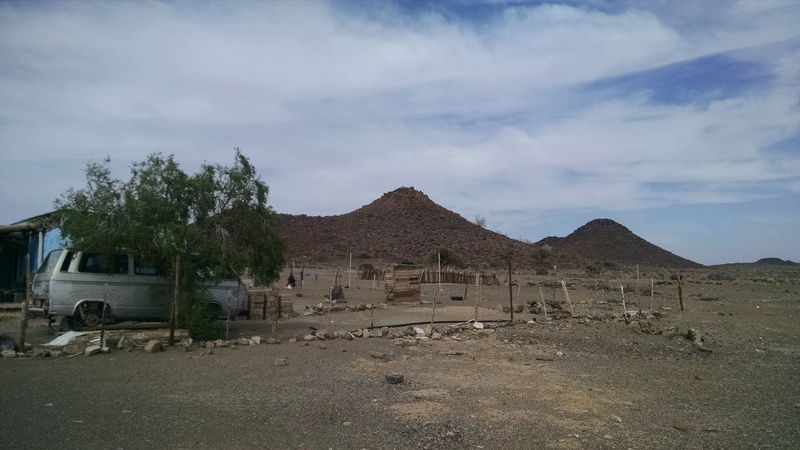 Warmbad was one of the first settled places in Namibia and it was once a much larger town before the building of the railway and the growth of Karasburg and Keetmanshoop. As the Bondelswart Nama migrated to the area from the Orange River, they came with their dogs. The Warmbad hot springs were discovered when the Kaptein saw the dogs were soaking wet – which was a sign that there must be a permanent water source. 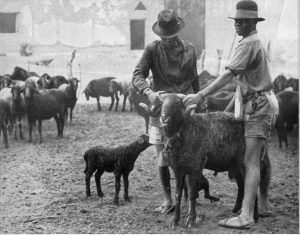 With increased German settlement at the end of the nineteenth century, though, many Bondelswarts found their way of life becoming increasingly at risk – shepherding was not as easy as it once was. White settlement had taken much of the prime land and water holes, so it’s not surprising that they joined up with the rebellion in 1904. Superior weaponry and supplies, however, forced the Bondelswarts to accept a “Treaty of Submission” at Ukamas in 1906. This reduced the size of their territory, initiated pass laws to leave the reserve, and placed them under German law. In addition, by 1907, the Germans passed the Hundesteuer Ordinance – the dog tax. With regards to the Bondelswarts, negotiations at Ukamas exempted the reserve and the Warmbad location from other fees and taxes, especially the grazing fees. When the South Africans took over after WWI, the dog tax became one of the few enforceable taxes in the Bondels reserve; and for that reason, it was enforced quite vigorously. 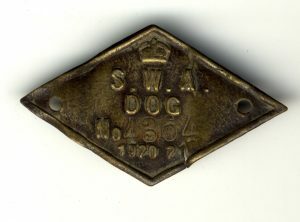 Each year, all dogs had to be registered with the magistrate and have a small metal badge attached around the neck (see photo). Under South African rule, the fees increased significantly. Anyone who failed to pay the tax, African or European, was given a fine, the dog was killed, and if he was unable to pay the fine, he was sentenced to prison with hard labour. The 1917 tax collection resulted in at least 3,000 African-owned dogs killed by police; the number of European-owned dogs killed: 135. Now why does this matter? It’s because £5 was a lot of money for a Namibian to pay to have his dog registered. At that time, £5 was about three-months farm wages, or the sale of 5-8 small stock. For the registration of a dog, that was a big monetary sacrifice; and for that reason, many Namibians had to hide or kill their own “native hunting dogs” in order to avoid being prosecuted by the police. But why the focus on “native hunting dogs”? The SWA administration firmly believed that dogs were behind destruction of game. However, only in official communications regarding dog taxes were they blamed. 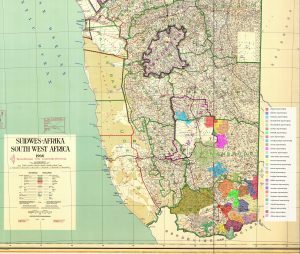 In the archival files labeled “Game: Destruction of,” the culprits were drought as well as poaching by White farmers and South African rifle parties. 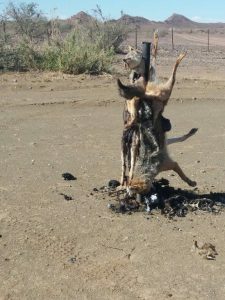 So although Black Namibians were hunting game from time to time with dogs, this was much more opportune than planned, and it was not the reason for destruction of game. Perhaps the reason for the dog tax, though, lies in the labour question. Throughout the central and southern parts of SWA at this time, there was a serious farm labour shortage. The growth of the Karakul industry increased labour demand, but yet the mines were still paying higher wages. Indeed, in some of the Magistrates reports, they note that hunting with dogs was a “lazy way” of earning a living, and hunting offset the “moralizing” effects of “honest labour” – contract/wage labour. Taxing dogs, therefore, had two major results. First, like other colonial taxes, they “monetized” economies, creating a necessity for cash possession and exchange. Secondly, and perhaps more importantly, limiting the number of dogs used in shepherding activities severely constrained the ability of shepherds to protect and grow their stock. Paying the tax for dogs, often “native hunting dogs,” necessitated selling some stock each year for slaughter, thereby preventing stock accumulation, or else one had to take up wage labour on White-owned farms. The brass dog tax badge looks remarkably like the old German pass tokens for labour in the police zone; perhaps this similarity is not just coincidental, but deeply symbolic. The dog tax played a large role, along with other state policies, in pulling Namibians away from self-sufficient livelihoods into contract/wage labour. The history of the dog tax isn’t the story of big men or big events, but the story of how those big events affected the daily lives of every Namibian who just wanted to hang about with man’s best friend. –If you have any personal knowledge about the dog tax, hunting with dogs, or anything that I briefly brought up above, I’m interested in hearing your story. Please contact me at +1-516-850-4418, or at bernardcmoore@gmail.com .